When you look at user intent across full AdWords data sets, it’s often possible to identify categories of behavior that can be used to develop a strategic focus for marketing. In the Life Insurance data-set (which has over 50M monthly searches) there are 14 high-level categories of behavior that contain an additional 21 sub-categories of search behavior. This collective behavior reflects the entire search experience associated with a single keyword phrase. The top category reflect consumers searching for information about life insurance in a broad and vague way. The following two categories have consumers searching for a company to do business with. 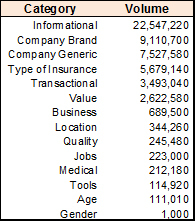 Interestingly, over 40% of these searchers do not specify a brand name, suggesting that this traffic is up for grabs. These three categories provide no new targeting opportunity beyond expensive PPC campaigns that hope to siphon off a percentage of this traffic to your website. Note: When you compare the Value vs. Quality categories the behavior suggest that consumers are much more interested in Value (2.6M) than they are in Quality (245K) by a ten to one margin. Each of these three high-level categories have well-defined sub-categories of behavior. For instance, the Type category has six sub-categories that exhibit a lot of variability around how consumers search for life insurance products. This behavior presents several micro-site opportunities. 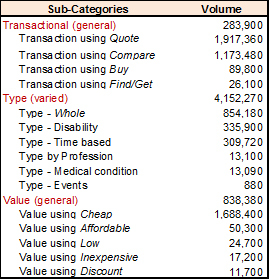 The Transaction category also has many sub-categories that provide the same opportunity. These three categories of search behavior reflect over 25% of monthly search traffic for Life Insurance products. Does this subset of traffic provide some strategic focus for the development of website pages and copy? absolutely! This behavior suggests conceptually that product, transaction and value be a unified theme when developing the website’s information architecture. Regardless of the approach you currently take to developing your keyword strategy – this augments your existing strategy by statistically / thematically targeting consumer search behavior. Related article: Introduction to User Intent – how consumers search for products and services.